Recycled Asphalt Driveways | Parking Lots, What's The Difference? Did you know there is a difference in the asphalt products that a paving contractor may apply to your driveway or parking lot or roads or highways? 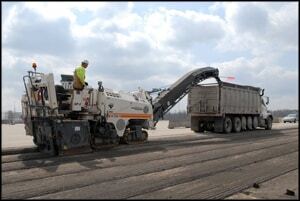 For recycled asphalt, the recycle mix used is 15-20% recycled materials and 80-85% pure. And what material is used to make up this recycled asphalt? Old roofing shingles which make up about 5% of the mix and road millings. Road millings are the ground up old road surface from old driveways, parking lots, roads, and highways. Note the picture of the road milling machine attached here. They take the top layer of road surface off grind it up then the material is hauled away and dumped at the closest blacktop processing plant for re-use. This kind of asphalt mix is ever so slightly cheaper than the pure kind. As a professional paving contractor, I myself personally prefer to use virgin blacktop over recycled blacktop. Virgin blacktop has no recycled materials – having not been previously used, these two components combine as a “virgin” mix. Only certain asphalt plants sell it. I buy it every day at Hempt Brothers Backtop In Camp Hill or Harrisburg. Does The Customer Have A Choice Of Paving Material? Yes, we are certainly willing to give people the choice, but few people ask. We do normally use virgin blacktop and yes there is a difference in price but the price difference is minimal. 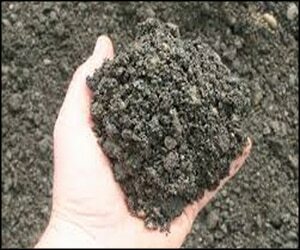 Is Virgin Asphalt Better Than Recycled Asphalt? Yes, virgin asphalt is better. This is mainly because of its leading longevity in structural stability and visual appearance. Recycled asphalt does deteriorate slightly quicker than pure asphalt. The result then is quicker discoloration, fading, darkened run-off stains, and other degradation. For such a minuscule difference in price, if looking for longevity above all else, pure asphalt is likely your top choice. Knowing the difference is how you get exactly what you want. If you have any questions or would like more information on asphalt applications, use our contact for paving form or call or call 717-932-8920.